The Eye on Employment is NWPB’s monthly breakdown of the latest data from Statistics Canada’s Labour Force Survey. 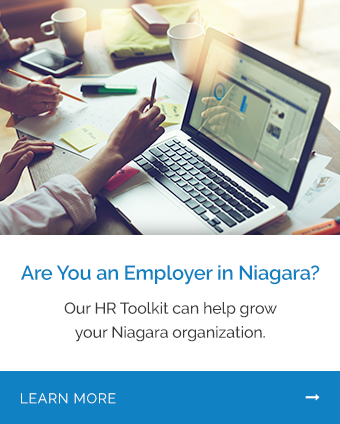 In this document, we will provide you with a summary of changes in local labour market indicators, offer comparisons to historical benchmarks, and show how seasonality affects employment in Niagara. First, a foreword on our source: Statistics Canada’s Labour Force Survey or LFS. The LFS is a robust tool that provides us with a considerable amount of data. At its core, however, it exists to sort Canadians into one of three groups: people who are employed, people who are not employed but are looking for work, and people who are not in the labour force. This is a people-focused survey, and the important thing to remember is that a count of people is not a count of jobs. People might do a job, either for an employer or through self-employment, but the LFS is counting the people, not the job. Bearing this in mind, let’s turn our eye toward employment. Month-over-month, we can see 2,400 fewer people either working or looking for work (a decrease in the labour force) between December 2018 and January 2019. There were 1,400 fewer people in full-time employment and 1,300 fewer people in part-time employment in January 2019 compared to December 2018. Compared to this time last year, January 2019 reports 1,300 more people with employment than was observed in January 2018. This change was largely attributed to increases in full-time employment. Specifically, January 2019 saw 2,500 more people employed in a full-time capacity than was observed in January 2018. With respect to part-time employment, there were 1,200 fewer people employed in a part-time capacity in January 2019 than in January 2018. Niagara’s unemployment rate increased from 6.3% in December 2018 to 6.5% in January 2019. This increase occurred alongside the month-over-month employment rate decreasing from 57.0% to 56.1%. Niagara’s labour market participation rate decreased slightly from 60.8% to 60.1%. In an ideal state of affairs, we would see decreases in the unemployment rate with increases in the participation and employment rate. It’s also important to keep in mind that the data in Table 1 are seasonally unadjusted figures. That means factors like holidays, expected employment slowdowns or pickups due to weather, and other factors that can be reasonably be predicted to influence employment are not accounted for in these data. Table 2 shows what the labour force looks like when we adjust for seasonality. Table 2 shows that there were 1,000 more people employed in Niagara between December and January which contrasts the decrease seen in the unadjusted data. When we look at the unemployment, participation, and employment rates, the month-over-month adjusted comparisons also show different trends compared to the unadjusted figures. The unadjusted data indicate that the unemployment rate decreased from 7.0% to 6.8% in January, and the employment rate increased from 56.2% to 56.4%. The participation rate increased slightly from 60.4% to 60.5% between December and January. Given some of the differences between the adjusted and unadjusted datasets, one might ask which of these figures is correct and/or should be used when reporting these statistics. The answer is that both are equally valid. Both measures are essential tools to understanding labour force trends in Niagara. In this case, these trends would suggest that when compensating for predictable and seasonable factors (e.g. expected slowdowns in retail sales in January compared to December or a slower local tourism economy in cold months) we would see a more active labour force. LFS data also allow us a snapshot of youth (defined as people age 15 to 24) employment in Niagara. Once again these data do not account for seasonality. Here we see 300 more youth working in January compared to December. There were 200 more youth working in a full-time capacity, and the number of youth working in a part-time capacity increased by 100. January saw the youth unemployment rate decrease from 11.7% to 10.3%, and the participation rate decreased from 64.7% to 63.3%. Similarly, the employment rate decreased from 57.2% to 56.7%. Compared to this time last year, January 2019 reports 7,300 more youth employed in a full-time capacity and 1,400 more youth working in a part-time capacity. We now offer the Eye on Employment in a downloadable PDF format. You can download the PDF by clicking this link. Would you like to know more? NWPB is ready for your questions. Reach out to NWPB’s CEO, Mario De Divitiis.